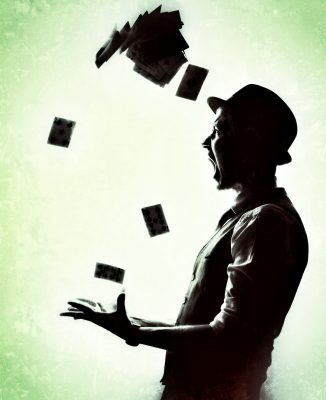 Never seen without his bowler hat adorning his magical head, award-winning party entertainer magician Darren Campbell is the incomparable “magic man in the hat” for the South West. 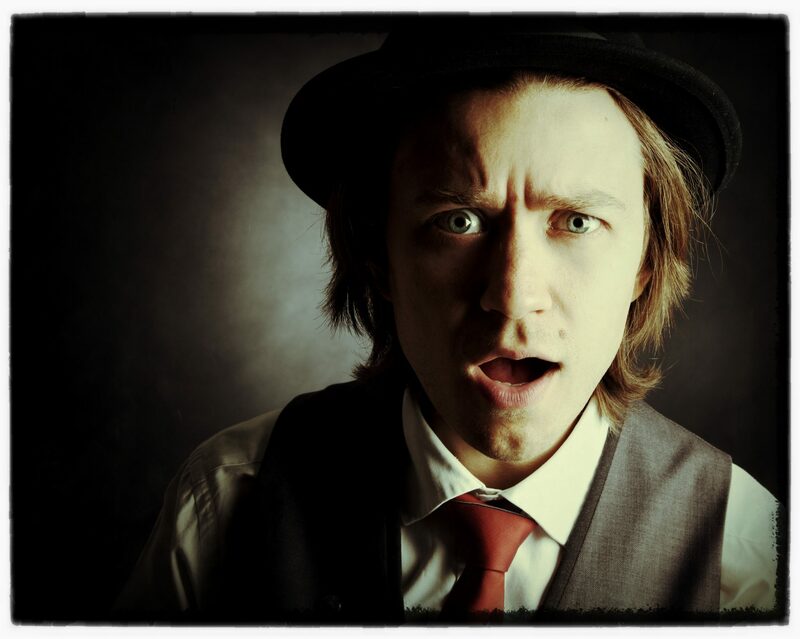 An award-winner, specialising in engaging, interactive close-up magic with a style of his own…. Here he is in action But what else is there to this magical whizz? So Darren…. Tell us! You ventured out in the snow and dark for an Oasis client at a winter party this year – brrrrrr – what do you think are the differences between winter and summer events – are there any from an expert party entertainer’s perspective…? It is fairly easy to adapt to inside or outside but sometimes extremes in temperature make some magic slightly more challenging. In the winter it’s all about warmth and comfort and those events can feel very special, the one I did with you guys in January felt extremely cosy with candles a fully draped marquee with rugs on the floor and fire pits outside etc…. What is the most exotic venue you have ever attended? I once performed at an event for Bloomberg and they had hired a whole national trust site in West London and literally they had transformed it into just the most ridiculously lavish party ever. I was performing in an Alice in Wonderland area with about 8 other performers we had the most amazing 20 ft table for a tea party we had a mowed lawn for flamingo crochet. A massive topary sign for our area it was just crazy, they had animal handlers walking around with snakes and reptiles…..they built a beach so people could play Volleyball there were fairground rides and every time of food imaginable. What is the most memorable event you personally have ever attended? I guess the queens jubilee, I was entertaining on one of the boats and we were part of the flotilla on the Thames. I always wear a suit with a waistcoat (no jacket) and my hat. What were you eating and drinking? On that particular gig we were all giving a little picnic box which contained a classic afternoon tea. 1 thing nobody knows about you? Well not many people know that I am a massive fan of Battle Rap! Whats is the experience you have had that you wish everyone could try? Did you always know you wanted to be a wedding and party entertainer, or what did you want to be when you were growing up? In your experience, what is the best venue for a corporate event? There have been two events in London where the view was just stunning – Cannon Bridge Roof Gardens was a highlight, and Landing Forty Two at the Leadenhall building. Nice, we’ll take a look… how about the best venue for a wedding? There are so many lovely venues but I love performing at – Cripps Barn, Cripps Stone Barn – Elmore Court – Barnsley House the list could go on and on. 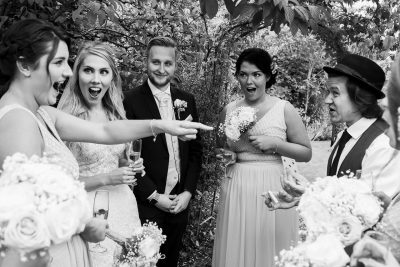 We totally agree, we’re in the most amazing spot and love a Cotswold wedding venue. Now then, please share with us the best bit of professional advice you were ever given? Paul Daniels was interviewed after me on a local radio station and he said ‘never leave your money in the dressing room’ pretty solid advice there. Fair play you cant go wrong with that! Now please tell us what you consider the highlight of your career so far as a wedding and party entertainer? Performing at St James Palace. And what would you say is the BEST thing about doing what you do, Darren? The way people react to it and how it makes them feel. If you were party planning for yourself and budget was no issue… what would you do? Do you know what I’d pretty much recreate my wedding because it was basically a massive party with all our favourite friends and family. We had it on a farm and hired two Yurts, Pieminister from Bristol did the day food. Pizza Monkey did the evening food. I bought all the drink and hired two bartenders I used to work with to run the bar. During the drinks reception we had the AcroChaps entertaining the guests and at the start of the evening reception we had a cabaret with Gentlemen Juggler and a magician. Then a band called The Brass Funkeys played later in the evening. I guess the only thing I’d change is maybe having someone to manage the event as I had made quite a schedule and there were lots of suppliers to coordinate. Your advice to someone about to plan their own party/wedding/large scale event? Organisation is the key and if you’re not organised hire someone ( Oasis!! ) who is. I have witnessed your work first hand at numerous events and those events are always great! Organisation is key and hiring a professional really takes that weight and worry off your shoulders so you can really enjoy your event. 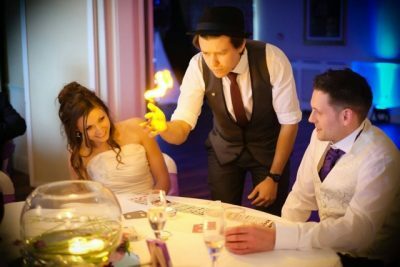 Well we have had the pleasure of witnessing Darren’s work as an expert party entertainer many times, and we love it.